There are a number of SEO metrics that are more important than ranking in the first page of Google. If you are able to identify and monitor these correctly, you increase your chances of actually getting to the top positions of Google and enjoy all the benefits. In the minds of many people SEO is about getting high rankings for particular keywords and while this is not false, it is not completely true either. SEO is about making your website easier to be discovered and understood by search engines and friendlier to users. If you do this using best practices then sooner or later, SEO will work and you will gain higher rankings. Why metrics are more important for SEO than rankings? To measure progress or lack of it: To say it simply, if you don’t measure SEO then there is no way to know if what you are doing is working or not. When doing SEO work for a website, it will not magically go from page 5 to page 1 of the SERPS but the improvement will come gradually that’s why it is necessary to measure and be able to identify progress. To justify your SEO investment: SEO costs a lot of money and nobody likes to spend money without getting a return. Even if you decide not to outsource SEO but do it yourself (or internally if you are a business), you are still spending valuable time which has a monetary value. SEO Metrics can tell you if the money you spend on SEO and digital marketing in general, is worth it. To motivate you to keep improving your website or blog: Digital marketers spend endless hours in front of a computer screen trying to promote web properties online and until you get the results you want, it’s easy to get disappointed and quit. Metrics can tell you if you are moving to the right direction and motivate you to keep going. One of the main differences of doing business on the Internet versus doing business offline, is that in the Internet everything can be measured with great accuracy. From site visits to button clicks and conversions, the figures you have in your disposal for analysis are endless. If you try to analyse and understand them all, you will get lost and lose focus on what is important to know that will enable you to take correct decisions for your digital marketing campaigns. To save you time, I will outline below the 5 most useful SEO metrics you should monitor on a daily basis. You want your website to rank for various keywords on the first page of Google, correct? 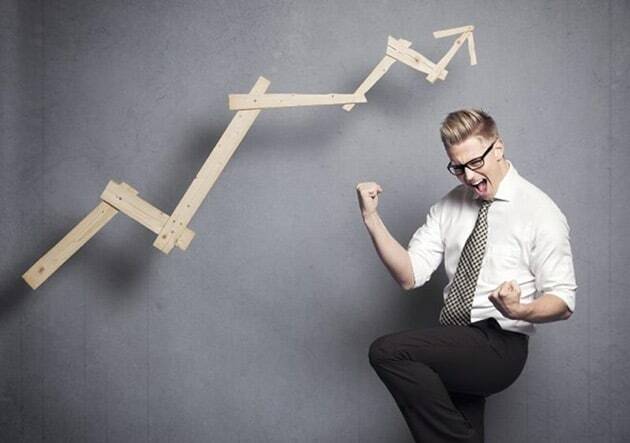 This way you will get traffic and make business (i.e. conversions). That’s the long term plan but until you get there you have to work you way to the top. The best and free way to monitor your ranking positions in Google is to use the ‘Search Analytics’ tool available under ‘Search Traffic’ in ‘Google Search Console’. ‘Google Search Console (formerly known as Google Webmaster tools)’, is a free tool provided by Google to webmasters which among other things, it also gives you details on how your website ranks in Google search. The first step is to register and verify your website with the Search Console (read this) and then navigate to the ‘Search Analytics report’. By default the report shows you the queries people typed in the Google search box and the number of clicks they received i.e. the number of visits to your website for that term. What you want to see is the average ranking position for those keywords and you can do that by selecting the ‘Position’ checkbox as shown above. A nice feature of the tool is that it allows you to compare your rankings positions for the last 7 days or for the last 28 days. You can do that by selecting one of the options under ‘Comparison’, in the ‘Dates’ radio button. There many other filters you can apply to the data to refine your results like device type (desktop, mobile, tablet), countries or even the type of search (web search, image search or video search), but for SEO metrics purposes you can concentrate on the average position. One thing to note about ‘Search Analytics’ is that the data is available for the last 90 days only so if you need more than that, you have to export the data every 3 months and keep it in an excel file. What is important to monitor when viewing your average ranking position is to find out for which keywords you are improving over time and also to spot which keywords are closer to <10 average ranking position (each Google search results page has 10 positions so if rank for a keyword on position 15, then this means you are on page 2). These are the keywords (click on the keyword to see which page is ranking for the particular keyword) that can generate more Google traffic for your website in the short term. To make those pages stronger, you can use internal links and also promote them in social media. When you check your Google Analytics reports to see how many visits you got, you will notice that you have visits from spammy websites that make no sense. These ‘fake’ visits are not real people that visited your website but they are ‘page requests’ from software programs. They do this for various reasons which I am not going to waste time discussing them, what you should do to evaluate if your traffic increases over time is to monitor visits coming from organic search i.e. people that used Google, Yahoo or other search engines to search for something and ended up in your website. 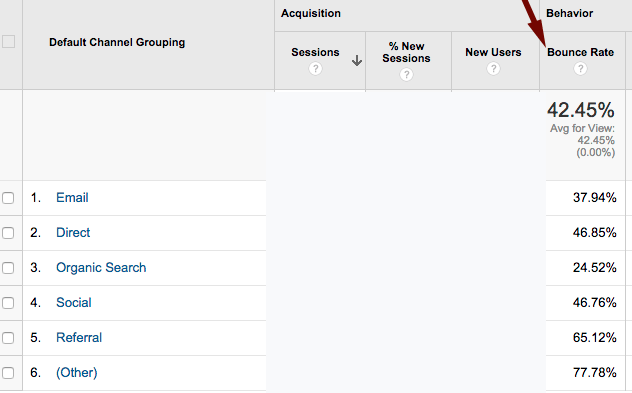 You can view this by looking at the ‘Organic Search’ report under ‘Acquisition / All Traffic / Channels’ in Google Analytics. Ideally you want to see these numbers in the report but because SEO takes time, what is more important is to experience a steady increase from organic visits. Use the date picker (top right of the screen) and select a range of 2-3 months and analyse how your organic traffic changed over that time. If you are working consistently on your website but don’t see an increase (at least a small one) then it means that something is wrong and you many need to change your SEO tactics. If on the other hand you notice big fluctuations in traffic (either positive or negative), this is again something that you need to investigate further. May be you were hit by a Google penalty and that resulted in loss of traffic or you have recovered from a penalty and that’s why your traffic increased suddenly. Regardless of the type of website you have, your goal is to keep visitors longer to your web pages and site. If people leave as soon as they enter your website, this is not good for them, it’s not good for SEO and it will not help you achieve your business goals. The bounce rate value tells you exactly this i.e. the percentage of people that navigated away from your website without visiting a second page. The lower the bounce rate of a page, the better. As you can see from the screenshot above, the bounce rate percentage is available in almost all Google Analytics report. How you can use this metric? Use it in conjunction with the organic traffic report to find out which pages of your website have a high bounce rate. These are the pages that you need to change in order to reduce the bounce rate and keep visitors to your website for longer. 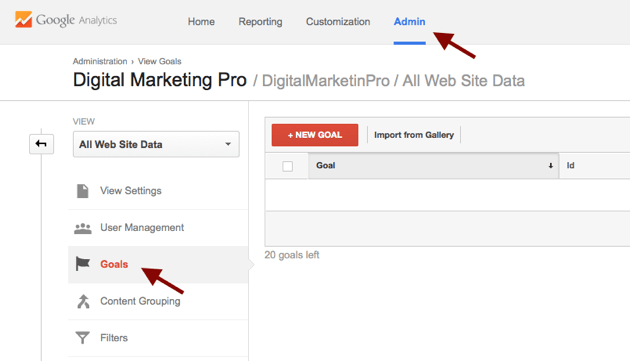 One of the nice things about Google Analytics is that it allows you to easily add and monitor website goals. As I have mentioned many times, all types of websites have goals, whether this is a sale of a product or service, visits to a particular page, clicks on ads or signups to a newsletter. You need to identify your website’s goals and create them in analytics. By doing so you will know how many conversions you had, the origin of these conversions (organic traffic, direct traffic, email etc) and in some cases the value of the conversion (this is mainly applicable for ecommerce stores). This is a feature you have to use even if you are not selling a product. Use it to track visits to your most important pages if none of the above is applicable to you. It will help you understand your website and audience better. There are a number of goals you can create in analytics including button clicks (known as Event tracking). This can be very useful when you want to see which buttons get clicked from a page that has more than one buttons that leads to your sales page. Don’t forget that a well optimized website can meet its business goals with less traffic compared and non-optimized website that has a lot of traffic. For example if you get 100 targeted visits per day and 10 of them convert, this is better than having a website that gets 10,000 visits per day and only 20 conversions. In other words, while it is good to always think of ways to get your website noticed, it is also recommended to analyze your current traffic and find ways to get more conversions. This way as your traffic increases, you will be in a much better position. Another useful metric you can monitor on a daily basis is your popular pages and visits per page. You can view this report in Google analytics under ‘Behaviour / Site Content / All Pages’. By viewing this report you can see the pages of your website tha get more visits and views per day (popular pages) and the visit statistics per page. You can use this data to understand what people read while on your website and find ways to improve the page content and or conversions. For example if most of your visits go to a certain page and only a few click to visit your ‘sales pages’, you can either make the ‘call to action’ more visible on that page (by adding a bigger style button for example) or use an exit popup to grab their attention when they leave or a customized widget for the sidebar of that page etc. The opportunities to improve a page and conversions are a lot provided that you do it in a controlled manner by running A/B tests that matter. It is normal to want your website to rank higher in the SERPS but it takes a lot of time and work to get there. In the meantime and besides working on your website’s content and promotion, you also need to closely monitor the 5 SEO metrics explained above so that you have enough data at your disposal to make the correct decisions for your business. Are there any missing important metrics that you need to monitor daily? Really helpful points. Can you tell something about the importance of Domain Authority, Google Pagerank and are these rankings still significant. If yes, how to improve them. Great post..! These 5 SEO metrics are most important because once you understand your visitors behavior you can optimize your website to improve results. Analysis of user activity helps to achieve the predefined goal of the website. You can make changes to your site based on actual data. Thanks, I actually never thought of the average daily crawl before, so it’s a new learning for me. If I may add, I think you can combine the first point (traffic percentage) with conversion. Because in my opinion, if you get too low of a conversion while gaining enough traffic, there is the possibility that we are targeting the wrong keyword. Again, thanks!